This first volume on François Catroux is a comprehensive consideration of the work and life of an international master of interior design. François Catroux is an innovator and explorer in interior design, who has always been a master of contemporary style. From his early days as a design prodigy, creating space-age boutiques for a house of couture and apartments that drew from Art Deco and modern design, to chic, mirror-studded interiors rich with glamour and elegant refinement in residences in Hong Kong, New York, and London, Catroux is at home in the vast world of design. His spaces may surprise with the introduction of irregular elements—a chandelier of elk horn or pink florescent lighting in a hallway—but Catroux’s hallmark sensibility combines the majesty and grandeur of high ceilings, elegant moldings, and gossamer draperies with elements that suggest comfort and tasteful, restrained opulence. Go-to accoutrements include sumptuous sofas, rich carpeting, gentle lighting, rooms lined with books, and ship staterooms in warm wood paneling with brass lamps, all measured according to a modern eye. 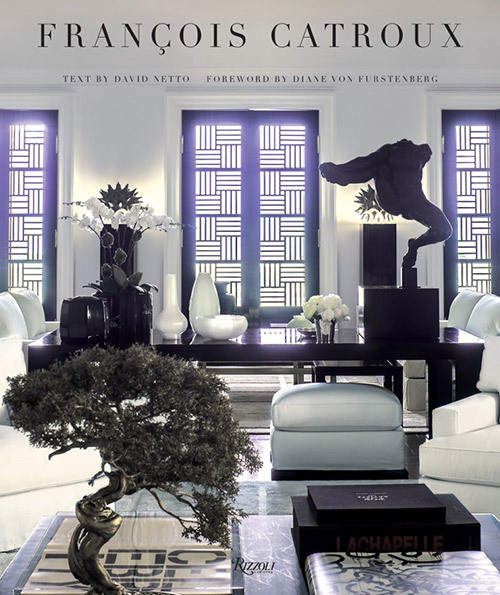 This book looks at Catroux’s career chronologically, featuring his first projects in 1968 through his latest, completed only this year, and includes the interiors of houses and apartments around the globe, from Paris to New York, Hong Kong to Los Angeles. Luxuriously photographed, this volume is more than just a design monograph on one of the great, and so far relatively untold, careers in the history of design—it is also a lively and intimate read about a life lived in great style. The career of François Catroux is the great untold story in design.